This recipe really belongs to Hugh Fairly-Longname but due to a slight over supply of some ingredients and under supply of others I think I can legitimately stake a claim to calling it my own. Over supply of allotment chives and parsley and under supply of crab meat means these should really be called Herby Crab and Potato cakes (and the addition of potato makes mine the recession version!). after chilling make them into smallish patties, cover first with flour, then with egg, then with breadcrumbs. 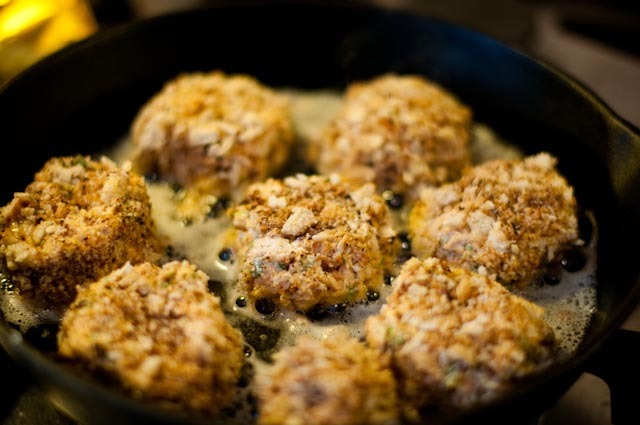 Heat oil and butter in a pan then add the crab cakes. Cook for about 3 mins on each side. Hugh recommended garlic crushed in mayo, but given that I was about to firebomb the main course with about 30 cloves of garlic, I thought it prudent to omit it from the starter. So I mixed horseradish sauce to the mayo instead and served the crab cakes with a dollop of that, a couple of lemon wedges and some rocket for accompaniment.